Mr. Confuse is a traveller between the styles. "Feel The Fire" is the debut solo album by the producer, arranger, composer and DJ from Hannover Germany. Collecting 14 tracks on his album Mr. Confuse takes us on an excursion from Hip Hop to Afro, Electro and Latin back to Funk. "Feel The Fire" comes as an organic statement for the analogue link between Hip Hop and Funk as well as an authentic and up-to-date plea for the original brass arrangements in the Funk and Jazz music of the Seventies. As part of the producer team Breakout, Mr. Confuse was already a household name in the Funk and HipHop community in 2006. His idea to reinterpret Afrika Bambaataa's "Planet Rock" as a Funk tune and in a Jazz-Breaks version gained Breakout massive international attention. Breakout split in spring 2007 and released their last 7" "The Funky Goofball/Lyve Wire" during the summer of that year. Mr. Confuse kept being a requested producer. He had numerous contributions for compilations ("Brazilectro”, "Battle Of The Year”, "Viertelbar”, etc.) and released three Mix-CDs ("Catch The Beat", "Confunktion" and "Brazilian Cuts"), using a wide spectrum of styles. Mr. 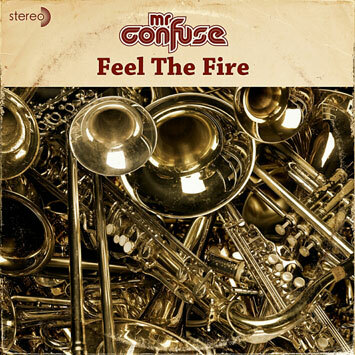 Confuse decided to produce "Feel The Fire" in a kind of style which is typical for HipHop: "I work sampler based. You look for parts of drum loops and other pieces in a record and build new music from it. This album was created in exactly that way." But sampling alone is not enough: "When the structure is there I will go and meet the musicians I work with. I work pretty much autodidactic and very intuitive - this can turn out really bizarre from time to time. Sometimes I'm humming or buzzing the melody I'm looking for to the musicians. I do not play an instrument myself, except that I use the MIDI-keyboard to be able to work with plug-ins and think of melody and rhythm. The musicians I work with will turn the ideas which I have in my head into music." This concept is as exciting as it is hard work: "I will return to my sampler with what the musicians played and often do a completely new cut. You may say that I use a musician as a sample library." Consequently recording "Feel The Fire" took quite some time, exactly "from the end of 2006 up to January 2008. In the end the complete album consists of about 10000 samples now. To finish an album like that is a matter of sweat and tears ...". So it comes as no surprise that Mr. Confuse can very clearly define his references and inspiration: "At the moment everything is Electro or Techno actually, at least whre I am based. The sound is very much Eighties, so clean, full of synthies and 808 programming. When we did Breakout in the summer of 2005 we felt completely different. It was all too clean for us, especially the mixes. I draw my influences from HipHop and I want to work on something I can identify with. HipHop is pretty much the only style I like in the Eighties, apart from Punk probably. Today everything sounds so calculated. It was the snare in the Eighties, today it is the kick drum. What I tried is to transfer the idea, better say the musical basis of HipHop, from the Nineties back to today. This is what it was like in the Nineties: HipHop tried to transform the sounds of the Sixties and Seventies into the here and now. So it was just natural for me that I tried to keep my sound dirty like it was in the Sixties and Seventies. My main idea by doing songs like "Planet Rock” or "Lookout Weekend” was to put the Eighties back into Seventies or Sixties by using technology of the Nineties – got it!? In the UK and elsewhere there are so many new bands who release handmade organic sounding Sixties and Seventies music right now and I think that is brilliant – it sounds authentic!" "Feel The Fire" will be released as a download and on CD, as well as a limited edition double vinyl album. The first single "Lookout Weekend" is coming with remixes by Lack Of Afro and Mash & Munkee, the second single "Imóvel" will feature mixes by Rephrase, Smoove, AIFF and The Afro Latin Vintage Orchestra. I am a big fan of Joe Farrell and the CTI label. "Hurricane Jane" is from Farrell's 1974 album "Penny Arcade". I took a break of that song as a basis for the intro of "Feel The Fire". The drums are not programmed on this track, but being played live by Lars Heindorf from the band Sugarhat. "Lookout Weekend" is a cover version of Debbie Deb's 1984 single on Jam Packed. A bonafide Latin-Freestyle Electro classic which was originally produced by Tony Butler! I quite like the contrast to turn an 80s track into a Funk track with a dirty bass line. "Going Somewhere" was recorded together with my graphic designer Florian Bochnig who plays the guitar on it. Actually, he is not a professional musician, but his style fits perfectly. The trombone by Matthias Brennecke really moves this song. Coco, Steel & Lovebomb had this 1999 track "Yachts" together with A Man Called Adam. They sampled this 60s Brazilian sounding piano and used it as basis for their song. I found this piano very interesting and inspiring. So I had the idea of doing a similar piano line, but with a horn section and also way faster. This worked out good and gave the Latin sounding piano line, I thought of, a Balkan feeling by being played that fast with a brass section. Emma Pujadas a.k.a. Lady EmZ from Barcelona is a MySpace connection. I think she has a brilliant voice and thought: Why not work together on something? It took months until I received the parts from her, because she did not have recording equipment at home and had to look for a studio to be able to record the song. In the end it worked out good and she had a brilliant vocal line for the song. Martin "Margot” Gontarski plays bass on this track, Martin actually was the bass player of the well known German funk band Spice. This track features a really nice battle between the Hakan Türközü's Hammond C3 organ and the incredible trumpet play by Szabolcs Smid. "Feel The Fire" is my highlight on the album. Henrik Pfeiffer was working on the guitar for "Lookout Weekend" and this track at the same time, so they both sounds perfect together. Matthias Brennecke plays this incredible bass trombone which goes through the whole track and which makes it really special, just like Lalo Schifrin had this special bass trombone in his soundtracks during the Seventies. We've been doing the sax solo when Simo Schneider came up with the idea to do an interpolation of De La Soul's "Ring Ring" in it. This was the last track I recoded for the album. Contrary to the other songs it was completely conceived with samples plus an incredible brass line by Matthias Brennecke. "Groovin' On The Spot" was recorded with Lionel Berton from "The Afro Latin Vintage Orchestra” out of Paris. Lionel is a great percussion player, also to be heard on "The Arrrgh Theme" and "The Groove Merchant". You simply do not find this authentic afro style where I come from. Same goes for a good baritone saxophone. Hakan Türközü is one of the best Hammond organ players in Hannover. I am happy that he played the Hammond C3 on "The Groove Merchant". After a long recording session for other songs we have been trying the sketch of "The Groove Merchant” just jamming around and at the end of this long day Hakan went really mad on it. "When I Hear Music” is the second Debbie Deb cover version on "Feel The Fire”. Inna Vysotska sings on this one as well as on "Lookout Weekend”, additional drums come courtesy of Lars Heindorf a.k.a. DJ Soul Surfer. The "Outroduction" is dedicated to my graphic designer Florian Bochnig. He has this great street art project called Arrrgh (www.arrrgh.org) which really needs his own theme tune - and he plays the distorted guitar, of course!